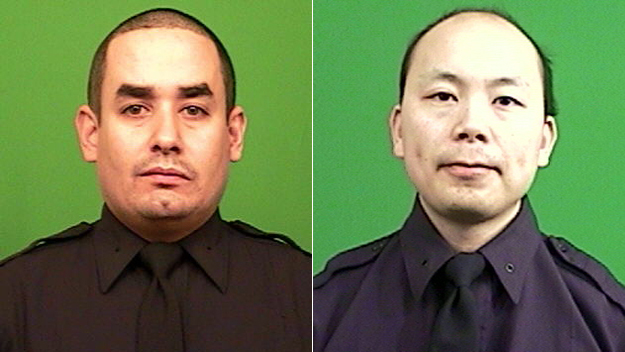 Yesterday afternoon, two NYPD officers, Wenjian Liu and Rafael Ramos, were shot at point-blank range by a man named Ismaaiyl Brinsley, who also shot his girlfriend earlier in the day in Baltimore. Statements made online by Brinsley indicated that he was killing cops as retribution for what happened to Eric Garner, but reports are also coming out that he had issues for a very long time. The reactions to this shooting are predictable, especially from the right. An NYPD police union even declared war on its citizens. We expect this. I’m going to talk now to those of you celebrating the shooting. Before I begin this letter properly, I need to let you know: I’m a card-carrying member of the American Civil Liberties Union and a donor to the Innocence Project. When protests over Trayvon Martin’s death happened, I stood beside people – as one of only a few white people in the crowd – and protested in Bridgeport, CT. I tolerated Ernie Newton and the Nation of Islam while holding hands with my friends and singing We Will Overcome. I get it. Police brutality is a legitimate issue, it’s one that any honest person will admit affects black people disproportionately, and it must be challenged and ultimately changed. So believe me when I say: you’re screwing this up. At best you’re burning any currency that’s been built up since the acquittal of Daniel Pantaleo; you’re only going to get more people hurt, or worse. 1) Speaking solely from a tactical perspective: we – by we, I mean protesters, supporters and others who decry police brutality – are in a position of weakness. It needs to be understood that a lot of people – I don’t have recent polls I trust, but I’m comfortable in calling this a majority – are perfectly fine with police officers using whatever means they have to control “other” people. To them, anything that threatens their sense of security of stability is open game. Remember: when the NYPD was spying on Muslims, most citizens approved of it; it didn’t affect them, if they didn’t have anything to hide, vague reference to 9/11, etcetera. These people are taught that the police are infallible. Yes, we know that there’s plenty of evidence to the contrary, but this is about optics. Simply put, we have to convert a lot of people, and rooting for murder is a poor way of going about that. Remember: everyone talks about Martin Luther King Jr., and it wasn’t because of his comments on rioting. Meanwhile, Huey Newton and Fred Hampton are footnotes. 2) None of what I said above takes into account humanity. The accusations people are making about the police is that they don’t hold into account the lives of those they “serve and protect”, particularly those of minorities. Statistics honestly bear all of this news out. But when you sit there and cheer for the deaths of two officers, with families that just lost someone before Christmas, take a look in the mirror and ask yourself what you have become. If you think so low of the police force or anyone in an uniform that you consider them monsters, do you really want to drag yourself to that level? Listen: I know people who are cops, or want to be cops, that I don’t trust with an ice cream cone, let alone a gun. The system needs reform. But when you cheer a senseless murder from an obviously deranged individual, you’re no better than the police. I’d argue you’re far worse, honestly. I’m sure there will be a chorus of “you don’t get it!” from people saying a white man on a site that prominently uses the Gadsden Flag can’t speak for how to approach the police. I’d argue it’s my position as a suburban white man that gives me a perspective of the people you’re going to have to convert to get real, honest reform, and not just a temporary burst of energy that burns off just as quickly. Trust me: I hold no love for the ignorant white doofus who thinks racism ended on July 2nd of 1964, complains bitterly that life isn’t what it was like in 1986 for some reason he can’t articulate, and doesn’t understand our political system beyond hating Obama. But he has to be converted, or at least made to understand a new normal. What is happening now is turning off that person. The more of those people that get turned off, the harsher the reaction can be from the NYPD and other police departments across the country. More death, more injury, more protests, more spinning of our tires. If we want true reform, and with it true equality regardless of race, then it’s critically important that we forcefully denounce Ismaaiyl Brinsley, denounce anyone who supports his actions, and keep working towards a better future for everyone. Chris, I think you aren’t going far enough; for reform to happen, the police must stop perceiving themselves to be the victims of aggression. The police genuinely seem to think that they are in constant danger. This perception is statistically untenable, but every death of a police officer in the United States buttresses it. My guess is that the phenomenon is very similar to the one that has created the perception that children are increasingly in danger of being abducted when in fact the stats say the opposite. Until this perception evaporates, they will resist reform, and they have the political clout to completely stymie it. No, you definitely have a point. But again: this isn’t about what’s right and wrong, necessarily. It’s about maximizing impact. And this shooting hurt us in that regard. And watching the NYPD’s union has been a revelation. I’ve never seen such an open coup, and as I was reminded on Twitter yesterday – in a timeline I wish I could have Sorify’d and linked to – it’s not even close to the first time they’ve done it. I was stunned, and even more stunned by the fact that it’s working (thanks, NYDN and NY Post). Right and wrong don’t work in politics, and this has to be a political victory. Optics are what matter.